Last month we shared an interview with Tweet’s Sweets discussing both her charity event to raise money for cancer patients and why cancer awareness is so important to her. Tweety has seen many close friends and family battle cancer, so she has dedicated her company and her baking skills to fighting back. Her most recent event, Cancer Bites: We’ll Bite Harder, raised $1,500 which was divided between three charities. Tweety told us that two of those charities had people waiting to receive the funds to help with the expenses for fighting cancer. At the event, Tweety made a shocking announcement: she’s now battling cancer herself. Instead of letting this discourage her, Tweety is pressing forward and is determined to overcome cancer while growing her business. To watch videos of the event, click here and here. After her fundraising event, Tweety found time in her busy schedule to hand-deliver cupcakes to us for a tasting. She provided three flavors: Suga Mama (Sweet Potato), Red Velvet, and Licia’s Puddin (Banana Pudding). Our initial reaction? This woman can BAKE! The sweet potato cake was incredibly moist. So moist in fact that Crusader Jenn said, “Maybe almost too moist?” I’m not sure how that is possible, except that it was a little difficult to pick up and eat, but being a cupcake warrior, I seemed to manage just fine. I think this was my favorite out of all three. Normally Red Velvet isn’t my thing (I reserve this flavor for our Red Velvet Crusader, Elisa), but Tweety had just the right blend of flavors and moist cake—which seems to be a rarity when it comes to Red Velvet. While the frosting to cake ratio might not seem to be enough for some, it was surprisingly perfect. This cupcake ended up being Crusader Jenn’s favorite. The moist cake was a bit denser than the Red Velvet, but that’s to be expected since it was packed with real bananas. 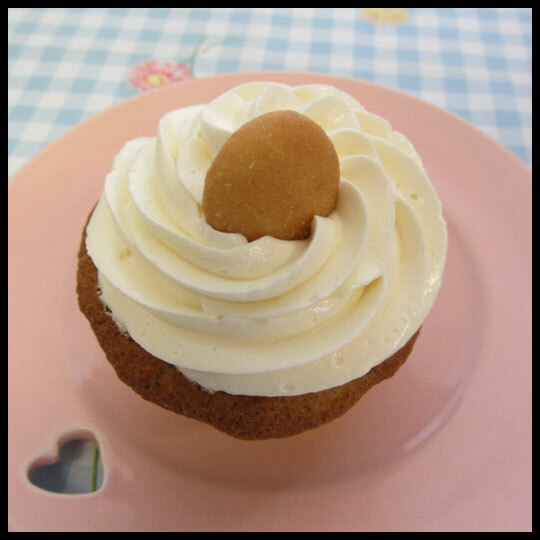 Because of all the fresh ingredients used, Tweety told us to keep this cupcake refrigerated. Normally this wreaks havoc on cake, causing it to dry out, but not Tweety’s cupcakes! It was just as moist and wonderful as if it was fresh from the oven. Tweet’s Sweets’ cupcakes are a rare find in today’s world of over-the-top cupcakes. They are simple with a homemade quality that doesn’t come around very often. With each bite you feel like you are sitting in your grandmother’s kitchen, listening to the stories of the “good ole days,” while snacking on fresh baked goods. She says she learned to bake from her “Nan” back when she was just a young girl and her love of baking is evident with each cupcake. Tweet’s Sweets recently celebrated their 5th anniversary by giving goodies away to their fans while raising money for the homeless (Tweety is a super-hero when it comes to giving back!). When asked where she sees herself in the next year, she replied, “Next year I am anticipating having another fundraiser where I announce that I have bitten cancer into remission.” We believe that with her drive and determination, Tweety can do anything! To read our full interview with Tweet’s Sweets, click here. As you may have already read from Jenn’s past two reviews (here and here), we had a great start to our Florida vacation! After a week of relaxing, visiting with family, swimming in the pool, going to the beach, and eating TONS of great food, we arrived at the last day of our trip. Before getting to Florida, we had already planned to do some cupcaking with our cousin and her daughter on the Friday before we left. 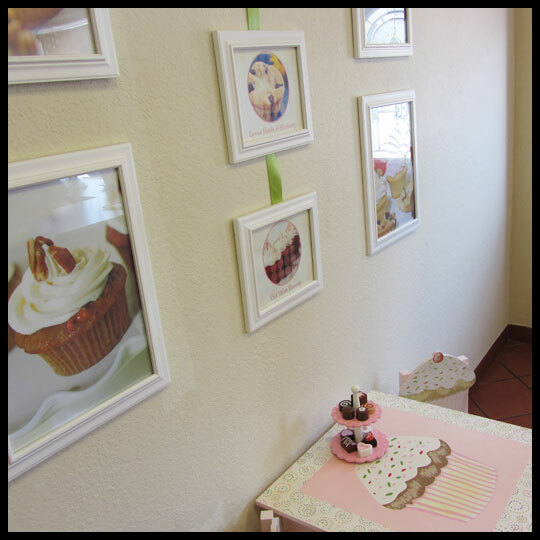 Excited to have new people to share our passion with and happy to spend more time with them, we decided to visit two cupcake shops in Naples, Florida: Sassy Cakes, a former Cupcake Wars contestant, and Simply Cupcakes of Naples. Our first stop was Sassy Cakes, tucked behind a shopping strip on 4th Avenue South in Downtown Naples. The first thing that jumped out to me in this cute little shop was an adorable kids’ table adorned with a hand painted cupcake graphic. This table really sets the whole tone for the shop, which also has cupcake trinkets scattered throughout, cupcake photography hanging on the walls, and a mismatched collection of plates which their cupcakes are served on for “dine in” customers. One of my current obsessions is finding cute and different dessert plates at flea markets and antique stores, so I was immediately in love. Cupcakes and fun plates? It couldn’t get any better for me at that moment. The owner and baker, Bayah, could not have been more sweet as she described the flavors and waited for us to make our choice. Normally I don’t have too many issues when it comes to flavor selection, but Sassy Cakes had so many I wanted to try, including mini cupcakes, that it took me forever. I finally decided on a full size Hazelnut Espresso Cafe and three mini cupcakes: Banana Pudding, Lemon Parade of Blueberry, and Caramel by the Sea. Jenn and our cousin, Megan, decided on a full size Banana Pudding, while Megan’s daughter and Jenn’s husband each choose a full size Cookies N Cream. Since it was only 11am, I thought the Hazelnut Espresso Cafe cupcake would be the perfect late morning treat. Plus hazelnut flavored coffee is my go to beverage when I need a morning – or afternoon – pick-me-up. (I’m not sure how I would survive without my Hazelnut Kuerig K-cups.) 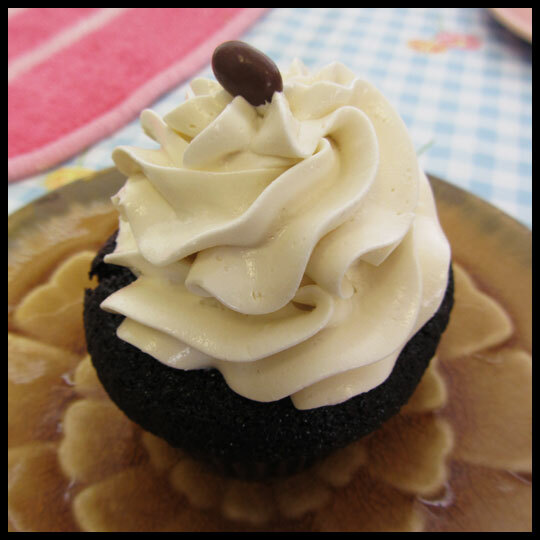 The chocolate cake on Sassy Cake’s Hazelnut Espresso Cafe cupcake was moist and filled with a rich chocolate hazelnut filling. The espresso frosting could have had a stronger espresso flavor (in my opinion) but Jenn thought it was absolutely perfect, so I guess maybe I just like my coffee strong? 😉 Overall this was a really tasty cupcake that I would definitely get again. 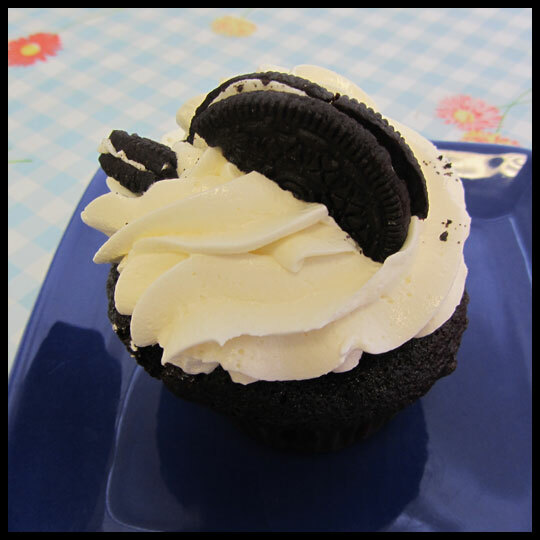 The Cookies N Cream cupcake was a big hit with Jenn’s husband, Dan, and my cousin’s daughter. 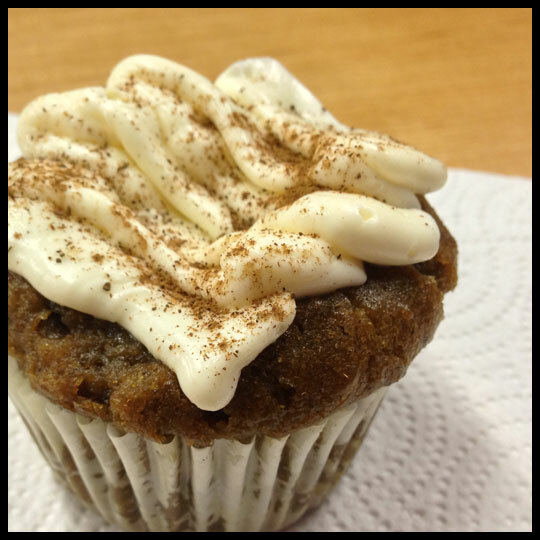 When I asked Dan his thoughts on the cupcake he responded with and enthusiastic “Ooooo…. Man…. It was GOOOOD!” He also added that he thought Sassy Cakes was awesome! 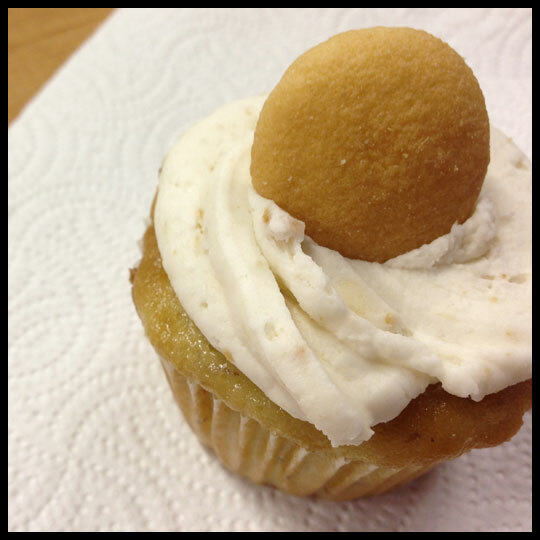 While the first two flavors were quite delectable, the stand out winner of the day was the Banana Pudding. I’m really glad I took a mini version of this flavor home with me, however, I’m kinda wishing that I had gotten a full size one. The soft, moist, banana cake was packed with flavor and the banana cream filling was spot on. This is a cupcake I could eat again and again. 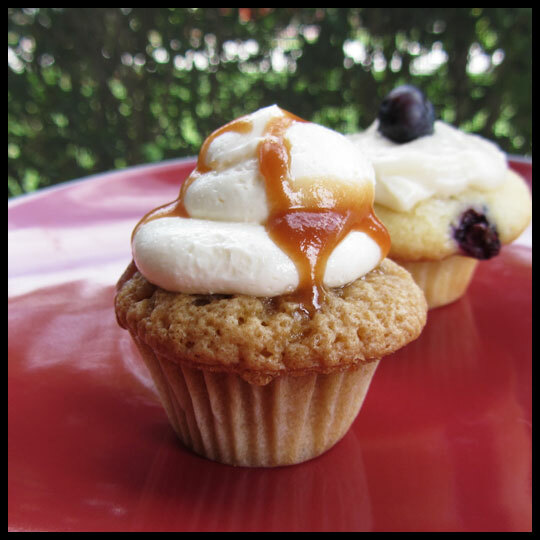 The only other time I’ve had a Lemon Blueberry cupcake was from Kupcakes & Co. and since they are one of my all time favorite cupcakeries, the competition was tight. 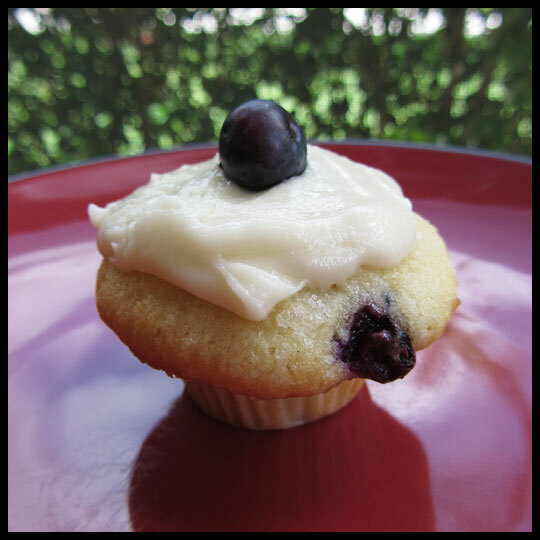 Sassy Cakes did a great job on their version, but if I’m given the opportunity again, I would definitely try the full size option because I only saw a couple of fresh blueberries in the cake. Even with that though, the cupcake was moist and fresh tasting, so I really enjoyed it. The last of my mini morsels was the Caramel by the Sea. I’m a sucker for anything with salted caramel and I unfortunately devoured this cupcake before taking any mental notes. But I guess that almost speaks for how good it really was and Jenn confirmed that it was one of her favorites too. As I mentioned above, Sassy Cakes was featured on Cupcake Wars, and in their season 3 episode, the Tim Burton Bake Off, they were eliminated in the first round because their tapioca filling didn’t set up leaving the cake mushy. I can personally attest that this must have been a fluke due to the tight time constraints, because all the cake and fillings were perfect in the cupcakes we tried. They bake their cupcakes fresh daily and it shows! Curious as to what happens to the leftover cupcakes, we asked if they worked with a local food shelter and were pleased to find out that they work with an organization called Maria’s Birthday Wish for the Homeless. Maria’s Birthday Wish works with several bakeries and shelters to bring happiness and recognition to men, woman, and children who are often forgotten on their birthdays. To find out more about their cause, please visit their website or Facebook page. 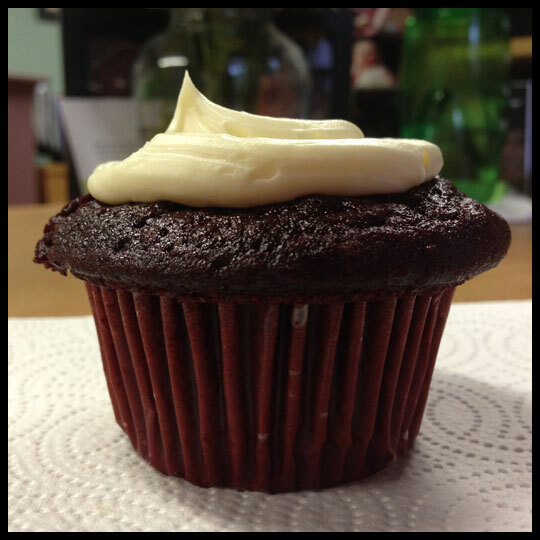 With all the tasty cupcakes, great atmosphere, and their desire to give back to the community, there are a ton of reasons why you should visit Sassy Cakes the next time you are in Naples, FL!